A quick review on what of my many favourites in Crabtree & Evelyn today! This regal botanical range is a beautiful blend of red pomegranate seeds packed with antioxidants and essential fatty acids, nourishing grapeseed oil and scents of pomegranate, citrus and fig leaves for a very sweet, fruit boost I can’t get enough of after a long day. The crowning ingredient is argan oil that is full of vitamin E and nutrients to truly nourish your skin back to tip top condition. 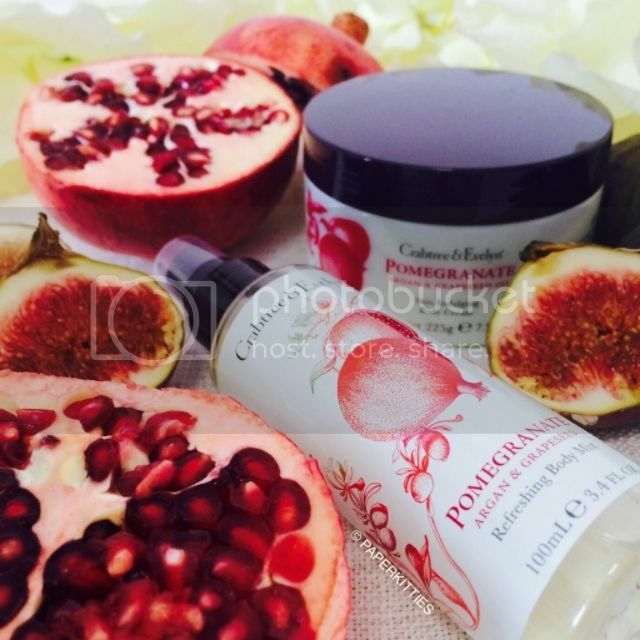 The star product for me is none other than Crabtree & Evelyn Pomegranate, Argan & Grapeseed Body Cream that not only smells delicious, but also works wonders in deeply hydrate my very dry skin without being too rich or greasy. I dare say that as I brought it to Perth and religiously applied it twice daily since it was Winter and I didn’t want my eczema to go haywire again. Once fully absorbed, I need not fear it being too sticky unlike some similarly rich body creams I own, making it a breeze for me to go about my daily chores. Back in Singapore, I only use it at night and have noticed how my skin almost instantly eats up this Crabtree & Evelyn Pomegranate, Argan & Grapeseed Body Cream. It is very good for dry patches and when I feel that my eczema is threatening to flare, immediately applying this helps keep the situation under control and have many a times kept the skin problems at bay. Comparing it to The Body Shop’s body butter, Crabtree & Evelyn Pomegranate, Argan & Grapeseed Body Cream texture is definitely more watery, light and hydrating; whilst the former is much thicker and richer – but both does the job equally well. And if you really like the scent, why not layer it with Crabtree & Evelyn Pomegranate, Argan & Grapeseed Body Mist – but that’s only if you’re staying in dry climates. Otherwise, keep the body mist for day use and the body cream for night. I like to think it as an instant hydrating boost throughout day. What’s your favourite Crabtree & Evelyn body care range? Do share with me! Previous Post Christmas 2015: Orchard Central Christmas Rhapsody!